The revelations made during the Third Roundtable Conference on Jammu and Kashmir, held in New Delhi on Tuesday, have a lot for the people of the terrorism-hit state to cheer up. As Prime Minister Manmohan Singh said, the exchange of views between the representatives of J and K and the Centre was ultimately aimed at improving the people’s quality of life. His vision for “Naya Jammu, Kashmir and Ladakh” was linked with the vision for a new South Asia and involved “reconciliation with Pakistan”. Fake police encounters are the most abhorrent legacy of terrorism in Punjab. The same is true of Jammu and Kashmir and several other states as well. Every such killing of an innocent person, branded a terrorist, has encouraged the killer cops to dispense with renewed vengeance this rough and ready brand of justice, which in reality is an extreme form of injustice. So many dark secrets have been swept under the proverbial carpet that it now looks like a tent of skeletons. Mercifully, uncomfortable questions have come to be asked by the courts. Chief Justice of India K G Balakrishnan is reported to have suggested that the practice of retiring Supreme Court and high court judges should be scrapped. In his opinion, such a move would impart greater stability to the legal system and remove the perennial shortage of judges. According to the CJI, such a system has worked wonderfully in the United States and there is no reason why it should not work here as well. The CJI was speaking at the fifth national conference of the Association of Retired Supreme Court and High Court Judges at Indore. In accordance with the prevailing discipline, the collegium consisting of the Chief Justice and two senior-most judges of the Supreme Court recommended Mr Justice Bhalla, the senior-most judge of the Allahabad High Court, for appointment as Chief Justice of Kerala. Doubts were cast about his integrity by, among others, Mr Shanti Bhushan, a well-known senior advocate who incidentally hails from Allahabad. The Lok Sabha Speaker echoed Mr Bhushan’s written allegations. The President felt compelled to send the file back to the collegium for reconsideration. Security was stringent. The 12-km road between Maur Mandi and my native place Damdama Sahib-Talwandi Sabo had over a dozen security barriers. Reason? After Operation Bluestar it was Damdama Sahib’s first Baisakhi Mela.At barriers grumpy policemen were shouting at and shoving the devotees. But the official “Press” sticker on my car had made things easy for me. The Iraqi Baath Party, the machine of Saddam Hussein’s tyrannical rule which now plays a key role in the country’s civil war, has been divided by an internal power struggle pitting one of Saddam’s top aides against a former general, U.S. and Iraqi government officials say.U.S. military and intelligence officials are still debating whether to welcome the power struggle or fear it. The Supreme Court has repeatedly expressed concerned about the fate of our highly polluted rivers, but no amount of judicial activism has so far been able to yield any results in cleaning them up. This is evident from various reports placed before the apex court on different river action plans, compelling Chief Justice of India K.G. Balakrishnan to hold out a threat of prosecution against officials of the central government and five riparian states. India is wary as the country with which it has the longest land border – Bangladesh – is caught in another political storm that was avoidable in the first place.Moreover, India’s security nightmare threatens to come alive as the Pakistani mission in Dhaka is abuzz with hyper diplomatic activity and Pakistani strategy-makers are determined to exploit the situation to the fullest extent. The revelations made during the Third Roundtable Conference on Jammu and Kashmir, held in New Delhi on Tuesday, have a lot for the people of the terrorism-hit state to cheer up. As Prime Minister Manmohan Singh said, the exchange of views between the representatives of J and K and the Centre was ultimately aimed at improving the people’s quality of life. His vision for “Naya Jammu, Kashmir and Ladakh” was linked with the vision for a new South Asia and involved “reconciliation with Pakistan”. The Working Groups on J and K have submitted their report except for the one on Centre-State relations, headed by Justice Saghir Ahmed. And it is a matter of satisfaction that the process of getting the relevant suggestions implemented has also begun. Interestingly, the Centre is not working on any formula put forth from across the border, as the statement emanating from Islamabad with regard to a settlement on Kashmir would make people believe. The Prime Minister is interested in what the Chief Information Commissioner and the Centre’s Kashmir expert, Mr Wajahat Habibullah, has suggested for the empowerment of the people of J and K. The Habibullah model outrightly rejects redrawing of borders and the so-called right of self-determination. The model includes setting up of two regional assemblies and promotion of local self-government through zila shooras and halqa majlis. It is based, to a large extent, on what Dr Manmohan Singh said at Udhampur in April, 2005. However, the separatist leaders are keeping themselves away from the Centre’s efforts aimed at bringing about a qualitative change in the people’s life. They boycotted the Third Roundtable Conference, too. This is unfortunate, to say the least. If they do not change their style of functioning they will be exposed as having no interest in the well-being of the masses in J and K. Their negative attitude only helps the cause of terrorists and their masters across the Line of Control. The separatists are more interested in getting the troops withdrawn from the state. This is what Islamabad, too, wants. But does this suit the people’s security interests? The Prime Minister is right in asserting that the question of troop withdrawal is directly linked to the activities of terrorists. Troop pullout is not possible so long as Pakistan’s promise on terrorism remains unfulfilled. Fake police encounters are the most abhorrent legacy of terrorism in Punjab. The same is true of Jammu and Kashmir and several other states as well. Every such killing of an innocent person, branded a terrorist, has encouraged the killer cops to dispense with renewed vengeance this rough and ready brand of justice, which in reality is an extreme form of injustice. So many dark secrets have been swept under the proverbial carpet that it now looks like a tent of skeletons. Mercifully, uncomfortable questions have come to be asked by the courts. That is why three IPS officers have been arrested by the Gujarat Police on a charge of murder for their alleged role in the death of a man in a fake encounter near Ahmedabad in 2005. Sheikh Sohrabuddin Sheikh was done to death and wrongly described as a Lashkar-e-Toiba operative targeting Gujarat Chief Minister Narendra Modi. The so-called encounter was so blatant that the government had to admit that it was fake and it disowned the police officers — Inspector-General (border range) D.G. Vanzara, Superintendent of Police Rajkumar Pandayan of the state intelligence wing, and M.N. Dinesh, SP of Rajasthan’s Alwar district. Vanzara was chief of the anti-terrorist squad at the time of the Sheikh’s killing while Pandayan was his deputy. IPS officers constitute the steel-frame of the police structure. They are supposed to be keepers of the force’s morality and integrity. But, in reality, they kowtow to the political masters by bending all rules. The abhorrent practice of faking encounters started as an extra-judicial method of eliminating terrorists who could not be controlled through legal methods. It soon degenerated into the cold-blooded murder of even innocents, either to please the bosses or to get rewards. Even Army men have been found to be involved in concocting such stories. India has had to pay a heavy price for this horror. The country’s reputation has been compromised. The common man has lost faith in the security agencies and junior functionaries have started emulating their seniors. Such killers in uniform are a disgrace and must be weeded out ruthlessly and given the severest punishment. If it is wrong on the part of criminals to target innocents, it is a hundred times more so in the case of government servants. Chief Justice of India K G Balakrishnan is reported to have suggested that the practice of retiring Supreme Court and high court judges should be scrapped. In his opinion, such a move would impart greater stability to the legal system and remove the perennial shortage of judges. According to the CJI, such a system has worked wonderfully in the United States and there is no reason why it should not work here as well. The CJI was speaking at the fifth national conference of the Association of Retired Supreme Court and High Court Judges at Indore. So, it is anybody’s guess whether his suggestion was intended merely to make his audience feel good or whether he expects the powers that be to act on it. There is irony in that he should have chosen such a forum to make his suggestion. If the CJI’s suggestion is implemented, then membership of the association can never increase, but only decline over the years because of natural causes. Sustenance of the association and its growth and development depend on judges retiring and enrolling as its members. Therefore, it is unlikely that his audience would applaud the CJI’s suggestion. The rationale advanced by the CJI is that superannuation of judges at 65 was a sheer waste of their ability, experience and expertise since that was when their intellectual faculties were at their peak. If the logic is extended beyond the judiciary, it is applicable to a host of other professions, including the academia. As longevity increases, in the absence of retirement — which provides openings for younger people to fill vacancies — we may be confronted with a scenario where some people never get employed; or are appointed only after they reach the present age of retirement. More than being preoccupied with the issue of retirement, or otherwise, of judges, the judiciary would better serve public interest by clearing the backlog of cases that have piled up. Former CJI Y.K. Sabharwal in his farewell Press conference stated that the collegium in the first instance cleared Mr Justice Bhalla’s file on the basis of information received from lawyers. He was probably referring to the meeting with the members of the Lucknow Bar that reportedly included Mr R.N. Trivedi, former Advocate General of UP and till recently Additional Solicitor-General of India, three other former Advocates-General of UP and three former Presidents of the Lucknow Bar Association. Presumably, they dealt with the allegations levelled and the collegium was convinced that Mr Justice Bhalla was not a villain. The President of India perhaps did not have the benefit of the Lucknow Bar leaders’ version. The unfortunate fact is that judges have no forum to answer criticisms or allegations. It would be embarrassing for them to give explanations even to their peers. The collegium, presided over by a new Chief Justice of India and a new member, reported to have advised the President again that there was nothing wrong with Mr Justice Bhalla and that he be warranted to proceed to Bilaspur for eventually being sworn in as Chief Justice. The route so far was the same as traversed by Chief Justice Vijendra Jain of the Punjab and Haryana High Court. The collegium must have had good reasons for clearing the name of Mr Justice Bhalla. But the commonmen in Chhattisgarh and elsewhere in India know nothing about what transpired in the judges’ chamber and they will view their new CJ with a wry smile. If only the broad reasons for rejecting specific charges against the judge concerned were to be published through an official Press release, people would have greeted their CJ with respect, even if disagreed with them. Rituals prescribe a bath before anointing and it applies to Mr Justice Bhalla as well — send with his image cleansed of the mud. The judges’ collegium’s saying “We have examined and found every thing OK” is no good or just as good as an ordeal by fire in privacy. What prevents transparency? The Supreme Court expects everyone else in this world to set out reasons for his or her decisions — with respect and rightly so. Fear of public controversies? Rumours breed more of them. Cases of Justice Bhalla and Chief Justice Vijendra Jain are only illustrative of the deficiency in the machinery for appointing judges invented by the judges of the Supreme Court in 1993. The collegium has no means of investigating into allegations — it can never have any. So, errors are bound to occur. For example, Mr Justice B.K. Roy, a judge of the Patna High Court, was appointed Chief Justice of the Punjab and Haryana High Court in the first instance and soon found not tolerable and sent to Assam and finally shunted to Sikkim not on account of his undue popularity in either of the states. That tiny state does not have enough lawyers to protest - it is a different matter that Chief Justice Roy in a short span reportedly designated a record number of lawyers from different parts of India as Senior Advocates. This distinction apart, his obvious unsuitability to the post escaped detection by the appointment machinery. The journey of Chief Justice A.N. Ray from the Calcutta High Court to Allahabad and to the ultimate resting place in a jinxed judicial sojourn viz., Sikkim, is another example. Fortunately, Sikkim can accommodate only one Chief Justice at a time. The decision of the majority of a nine-judge Bench (5 : 4) in the Second Judges’ case (1993) is the foundation of the current drill and the fountainhead of the present ills. It was intended to protect the judiciary from interference by the executive. The prescribed mode of appointment and transfer, in effect, justified the devil’s definition of the judiciary as an institution “of the judges and by the judges”. But the over-emphasis on the “legitimate expectations of the judges” (incidentally, “legitimate expectation” as a principle was applied for the first time by the same learned judge — Mr Justice Varma in a case relating to cattlefeed (1992) but it was found inappropriate in the context of judges in the 1998 opinion) and the stress on “seniority” have made this institution “for the judges” only. The concept of seniority — the theory that one who stood longest on the conveyer belt is the best — obviously was underlined to “lend greater credence to the process and would avoid any distortion in the seniority between the appointees drawn, from the same High Court” — obviously an obeisance to the sacredness of seniority and of judge protection, a measure of protection from their own brethren! The whole of this New Testament treats the people’s interest not even as a legitimate byproduct of that of the judges. Ever since the new regime dawned, the tenures of Chief Justices of High Courts have progressively become dangerously short — dangerous to the well-being of the state judiciary. The office of the Chief Justice of a High Court is not just a ceremonial one. The CJ is expected and can contribute much for the state if only he is allowed enough time to know at least its geography. But the seniority and legitimate expectations of a judge have resulted in the longevity of the tenure of a CJ to depend upon the accident of a vacancy in the Supreme Court Bench. Of late, the turnover of judges in the Supreme Court is so large that no incumbent has time to settle down to make lasting contribution. All these were foreseeable consequences, but the 1993 verdict failed to notice them. And ever since no one has attempted to correct the course if, in fact, recognised as the error. Surely from the country’s point of view, appointing the best available talent to man the apex court and as CJs of High Courts with long enough tenures is far more important than satisfying the expectations of a judge or two — unless the institution is to remain only “for the judges”. The subsequent clarification in the Special Reference 1 of 1998 would normally have not altered the 1992 decision which amounted to “law declared”, while the opinion on a reference under Art.143 is just an opinion — not a binding judgment. Nevertheless part of the opinion of 1998 like enlarging the collegium was implemented. But the assertion in that opinion that merit — not seniority — is the predominant consideration for appointment appears to have escaped recognition. A well-designed National Judicial Commission with provision for participation by the other wings of the State may be the ultimate solution. If only the age of retirement of judges of the higher judiciary were to be uniform — viz., 65 years — the “seniority and expectations” would vanish because the issue really is the additional three years of service. Until better alternatives are in place, we should learn to trust our experienced judges to identify merit without fear or favour and without reference to seniority. The writer is Senior Advocate, Supreme Court of India. Security was stringent. The 12-km road between Maur Mandi and my native place Damdama Sahib-Talwandi Sabo had over a dozen security barriers. Reason? After Operation Bluestar it was Damdama Sahib’s first Baisakhi Mela. At barriers grumpy policemen were shouting at and shoving the devotees. But the official “Press” sticker on my car had made things easy for me. In sharp contrast to the hubbub of mela, my ancestral house located on the rim of Takhat Sahib complex was shrouded in bizarre silence. Ever since I became a journalist it had been always a buzzing place every Baisakhi. Its suitable location had attracted journalist friends to frequent it to freshen up or to do exclusive interviews with their news sources attending political rallies nearby. Gradually, political leaders, PR personnel and sleuths from intelligence agencies started dropping in at my house looking for Pressmen, of course for different reasons. Instead of describing the “others” she hinted towards a corner where a group of persons was squatting on charpoys. Joining us my father, an incorrigible optimist, advised her to remain cool. But her grumbling continued. In fact my younger brother had disclosed to her that the wife and the son of a top extremist leader killed in Operation Bluestar and an underground Jathedar from a Sikh seminary were present in the group. The second floor of the house was humming. Several Delhi journalists were buttonholing Gajja Singh, an ideologue of Sikh extremists. Peeping down into the courtyard, I found my mother still standing clutching her belly and looking pleadingly at me. Professional ethics and etiquettes got blurred in my head and guilt overtook me. I could not wait for the interview to conclude and journalists to pack up. I took Gajja Singh aside. Actually, it was he who had brought the group of “others” to the house. Whether it was the icy look in my eyes or his little personal acquaintance with me, the “ideologue” understood my concern. The interview was called off. The journalists trouped out through the main gate and Gajja Singh escorted the “others” out through the back door . As the “outsiders” left; my mother bolted both gates. Her hands which till then had remained only on her belly suddenly rose in prayer, “Waheguru tera lakh lakh shukar hai” . “I’ll never allow those patarkars in!” she asserted. “Patarkars, OK. But what will you do if the ‘others’ come back?’ He quizzed her. For a moment she looked blankly at both of us. Then suddenly her hands rose and she clutched her belly again. The Iraqi Baath Party, the machine of Saddam Hussein’s tyrannical rule which now plays a key role in the country’s civil war, has been divided by an internal power struggle pitting one of Saddam’s top aides against a former general, U.S. and Iraqi government officials say. U.S. military and intelligence officials are still debating whether to welcome the power struggle or fear it. But they agree the outcome could strongly influence the course of the Sunni-led insurgency against Iraq’s U.S.-backed government. On one side of the power struggle is Izzat Ibrahim, also known by the name Izzat Ibrahim Al-Durri. He is the highest-ranking member of Saddam’s inner circle who was never killed or captured by U.S.-led forces. The king of clubs in the Bush administration’s “deck of cards” that depicted the most-wanted members of Saddam’s regime, Ibrahim was Saddam’s chief deputy and has long been viewed as a ringleader in the post-war insurgency. The forces apparently seeking to oust Ibrahim from his leadership of the Baath movement are led by a former general in Saddam’s army, Muhammad Yunis al-Ahmed. The battle between the two first came to the attention of U.S. officials after a meeting in the Syrian town of Halab, north of Damascus, which involved Baath party leaders, military and intelligence officials believe. The meeting in January, shortly after Saddam’s hanging, led to an apparent split in the movement. Some U.S. commanders in Iraq believe that was a welcome development. They see Ibrahim and his followers as intransigent elements of the Saddam regime who are trying to get regain control of Iraq. Yunis’ faction may be more willing to seek peace with the country’s U.S.-backed government, the U.S. commanders hope. Others, including U.S. intelligence officials and some Iraqi officials, are more wary, viewing the internal battle as an attempt to put a new face on a Baath movement that remains a threat. “These guys, number one, are very capable. They know how to lead, they know how to control, they know how to dominate, and they know how to execute a coup,” said a U.S. military official, explaining why Iraq’s Shiite majority remains fearful of a Baath resurgence. The official, like others, spoke on condition of anonymity when discussing intelligence assessments. According to Iraqi officials, the government in Baghdad is considering reaching out to Yunis as part of its effort to revise the sweeping policy which forbids most former Baathists from participating in government activities. One Iraqi government official said Prime Minister Nouri al-Maliki has authorized initial overtures to Yunis, while contact with Ibrahim remains taboo. The official noted, however, that the outreach may not go far. Al-Maliki’s overall efforts at softening the de-Baathification policy have consistently been blocked by opposition from other elements of his Shiite-dominated government. Ibrahim has kept such a low profile that U.S. officials said they have frequently suspected he was dead. But he has emerged as at least the titular leader of the Baath movement, which American officials believe controls significant amounts of money – assets of the former regime and new resources gained through current activities in Iraq. Ibrahim “probably commanded great respect, especially from the very most senior political elites that were still left from Saddam’s regime,” said the U.S. military official. Although accounts of the meeting in Halab vary, U.S. military and intelligence officials said partisans loyal to Yunis “hijacked” the session and expelled Ibrahim and others affiliated with him, declaring Yunis the new party head. According to the U.S. military official, Ibrahim, who was not in attendance at the meeting, quickly responded by issuing a communique denouncing Yunis and declaring he was no longer a member of the party. Those U.S. officials who see the divisions within the Baath as a positive development believe the split reflects a recognition by Baathists that the current Iraqi government would never reconcile with Ibrahim, given his close ties to Saddam, said a Pentagon consultant who was briefed by military intelligence officers during a recent trip to Baghdad. “It is the Baath Party’s realisation that the Shia-dominated Iraqi government would never make a deal with the former Saddamists, who have so much Shia blood on their hands,” said the consultant. But the U.S. military official expressed the views of others in the intelligence community and the Pentagon who are more skeptical about Yunis. These officials worry that Yunis’ group could be plotting an effort by the Baath to regain power. “Why do the Shia have such problems with this? They don’t want the Baath Party anywhere close to them, because they’ve seen what happened in 1963, and 1968, and 1979,” the official said, referring to coups orchestrated by Iraqi Baathists. This is for their failure to account for every single penny spent on implementation of the ‘Ganga Action Plan (GAP)’ launched with much fanfare by the late premier Rajiv Gandhi, with a provision of nearly Rs 1,000 crore, to be spent in phased manner. But the CAG, in its reports for the period 1993-2000, came out with startling disclosures of large scale corruption in the project at every level, with the money virtually going down the drain with the dirty water. The Court has been repeatedly asking the Centre to submit a utilisation certificate for the money released from time to time, but the officers concerned were evading submission of the same, prompting the CJI to tell Additional Solicitor General Vikas Singh that if he failed to produce the certificates by May 17 on the funds, the officers could not escape prosecution. Corruption was not confined only to the GAP as the Court had found that the Yamuna and Gomti clean-up projects had suffered the same fate, with Rs 1,700 crore spent on the former and Rs 400 on the latter proving to be a big waste of public funds. The condition of these rivers have gone from from bad to worse. In a ruling that would have a bearing on hundreds of defence personnel seeking discharge on medical grounds, the Supreme Court has held that if a disease had remained dormant in a personnel at the time of his recruitment, but could not be detected during his mandatory medical examination, it will not be deemed to have occurred during service, to make him entitled for the ‘disability pension’. Defining the provisions of Pension Regulation for defence forces, the apex court said if a disease is accepted as having developed during service, it must also be established that the conditions of military service had determined or contributed to the onset of the disability. The ruling came on the Defence Minsitry’s appeal, challenging the grant of disability pension of Rifleman Keshar Singh from UP by the Allahabad High Court. He was discharged from service in 1986, ten years after joining the force, after having found to be suffering from ‘schizophrenia’, which had remained dormant in him for years and could not be detected at the time of recruitment. The High Court had accepted his plea that the disease developed because of the strenuous job conditions of the Army. But he failed to produce any medical opinion either from the Army Medical Board, or other expert doctors - hence the apex court found the High Court order contrary to the law. A government officer recruited through a selection process of the Union Public Service Commission (UPSC) will not be entitled to its opinion if proceeded against for any act of corruption, the Supreme Court has held, lifting the panel’s protective cover over unscrupulous bureaucrats. The Court said, under the relevant constitutional provisions, it was not mandatory to supply the copy of the UPSC advisory on the action to be taken against bureaucrats during the departmental inquiry. 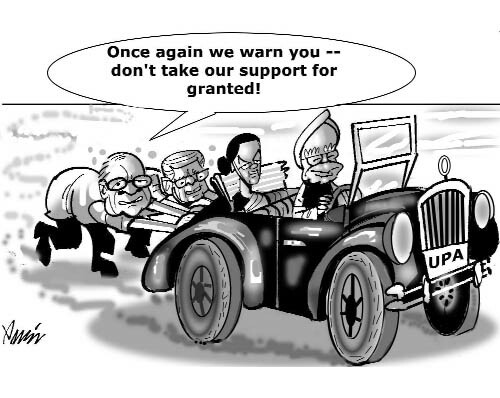 Article 320 of the Constitution does not confer any right on a public servant to have access to the UPSC opinion. Neither does it afford a right on him to seek a legal remedy for obtaining it. The ruling came in the case of a Telecom Engineer from Gujarat, proceeded against for allotting seven telephone connections illegally and causing huge financial loss to the department. The UPSC had recommended substantial reduction in his pay for making good the losses, which was accepted by the departmental inquiry committee. The Gujarat High Court had quashed the punishment because the UPSC opinion was not made available to him, but the apex court set aside the order terming it as a wrong interpretation of the law. India is wary as the country with which it has the longest land border – Bangladesh – is caught in another political storm that was avoidable in the first place. Moreover, India’s security nightmare threatens to come alive as the Pakistani mission in Dhaka is abuzz with hyper diplomatic activity and Pakistani strategy-makers are determined to exploit the situation to the fullest extent. There is a new mess in the making in Bangladesh, which has thrown a spanner in works of the army-supported caretaker government, led by chief adviser Fakhruddin Ahmed. In a hurry to banish the two Begums – former Prime Ministers Khaleda Zia and Sheikh Hasina – the interim government has bitten more than it could chew. In two parallel but equally immature moves, the Bangladesh government is trying to prevent Hasina’s return to the country and forcing Begum Khaleda Zia to leave the country for exile in Saudi Arabia. Both the Begums have refused to play ball. Cases against Hasina include corruption and murder. Khaleda Zia was threatened with dire consequences for her two sons – Tareq Rahman Zia and Arafat Zia. The unforeseen twist in the tale came when Khaleda Zia, who had initially agreed to go into exile with both her sons, changed tack. The assessment here is that Zia reversed her decision after the government refused to let Tareq go out of the country. The double blow for the interim government came yesterday when a Dhaka court stayed the arrest order against Hasina. India’s Bangladesh-watchers are at a loss to say whether the Fakhruddin Ahmed government got the correct legal advice in making the moves against the two political leaders. There are also issues of international law and contradictions in evoking national laws. While an order was issued not to allow Hasina back into the country, a court ordered that her properties be confiscated if she did not surrender to the court. The move to prevent Hasina from entering her own country is bad, both in international and domestic law. A citizen of a country has the inalienable fundamental right to reside in his or her country. Hasina can reside in a foreign country only if she has visa or residence permit. But the privilege depends on the foreign country concerned. The Bangladesh government has no locus standi. In case Hasina is refused residence by a foreign country and not allowed to enter her own country, she becomes a stateless person. Hasina is willing to face charges in her country and is ready to be arrested on arrival. This is a challenge that the army backed-government did not expect. What has worsened the scenario for the interim government is that Khaleda Zia has suddenly found support from sections of the army. This has strengthened her resolve to face up to the government. The Army Chief, Lt-Gen Moinudin, and the GoC of the all-important 9 Div Savar Cantonment, Maj-Gen Masud Choudhry, are exhibiting political ambitions. They obviously have some foreign support.